I guess I've gone big time. I just got a couple of TC Running singlets- I guess that means I'm sponsored? I got 'em free, so that means something. I'll pretend that means I'm sponsored anyway. I don't get any free stuff, but I do get a pretty good discount. I'll take it, but I mean I want some free stuff. If I'm wearing a TC Running logo on my chest, I need an incentive. I think I'll take that into my next bargaining session. 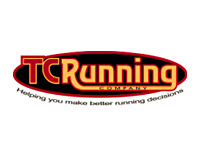 In all honesty though, TC Running's a great store. I feel proud to wear their logo, my brother works there; if you're in the Twin Cities metro area, hit it up. In other news, I returned my Brooks Adrenaline 9's. I bit the bullet and paid the $20 restocking fee and am going to go out and by a new pair of Adrenaline 8's. Earlier on the blog I was complaining about the stability and support of my then new GTS 9's. 50 miles in, I'm injured. Coincidence? maybe, probably, but a month out from my first half I'm not willing to take any chances.